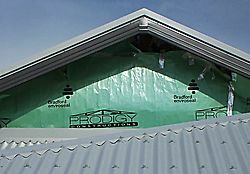 Insulation foil, Sarking, "Sisalation", "Thermafoil", "Anticon"
Insulation foil - Foil to a gable end, note that the roof flashing is fixed first and the foil goes over it.nbsp;Any condensation will run down the face and onto the roof. Reduction of heat in summer. Loss of heat in winter. Reduce and control condensation in roofing and walling. Reduce noise from rain, thermal expansion etc. It come in rolls 1350 (4'6") wide, and 20M and 50M long. They are built up of laminates of bitumenised paper reinforced with presumably sisal, and aluminium reflective foil. They used to be totally reflective both sides, which made it a hell of a job to fix up here in the tropics. It was blinding. This shot from the outside shows that the manufacturers have put on a coat of less reflective material (anti glare) to cut down on reflections when fixing. This side, usually blue or green is the top. The side you see when fixing it. I have not got a shot here of roofers fixing "Sisalation" (a bit like "Biro", a generic term used by us old farts for any of the various manufacturer's products) They are so quick, and they do it early in the morning before it gets hot and more to the point, windy, but you can see from this shot from inside that it is very shiny. You can also make out that it runs parallel to the ridge or battens. The first roll starts at the bottom and the successive ones up the roof overlap the one under by minimum 150 (6inch) . The overlap distance is marked on the rolls. The top sheet will straddle the ridge and overlaps the ones under it. You can see that the valley gutter was fixed first and so the Sisalation runs into it. The sarking should sag between the purlins, to create an air gap between the roof iron and the reflective foil. The manufacturer's say a min of 20mm. This is to maintain the thermal efficiency of the material. 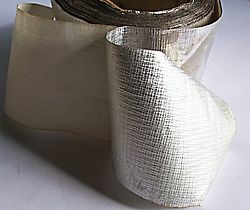 Insulation foil - Foil sticky tape used for sealing the joints. The joints are sealed with the manufacturer's proprietary tape and you may think it is a bit pricey, but don't be tempted to get something cheaper. This stuff is good gear and it is needed to last the lifetime of the roof. Here is a shot of a part roll I have left over from a job. (It's great for other jobs too). You can see it is on a backing paper that has to be peeled off as you are rolling it out and sticking it down. It has fiber reinforcing in it. 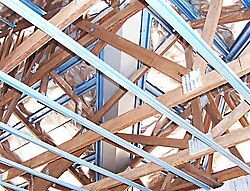 The whole Idea of laying the Sisalation is to lap in in such a way as that any moisture from condensation will make its way down the roof and out at the eaves. if you go back to the first shot in this section, you can see that the Sisalation (on the vertical face of the gable) goes right down to the roof surface on the gable end. The last piece of horizontal flashing up to the gable end, will have an upturn of about 100 or so, and the Sisalation covers the flashing upturn so that any condensation running down the Sisalation finishes up outside the roof. Insulation foil - Foil overlapping the outside wall. This is basic principal, to not let any condensation that forms on the inside of the roof sheeting drip down inside the roof space where it causes mildew and even stains the plasterboard ceilings. To the right is a shot looking up at the top of the wall and the roof overhang, out side of the house. 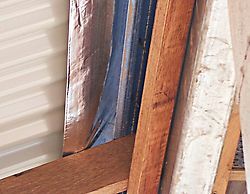 You can see that the Sisalation is overlapping the wall and last batten. Any moisture making it's way down the roof will drop off outside the house. Fixing the sarking is a crap job, I don't think anyone enjoys it. A gust of wind can rip a couple of hundred dollars off your roof in seconds, but it has to be done and done right. Quite often in windy conditions or on large roofs the Sisalation is rolled out a section at a time and covered with the roof sheeting straight away. I always used medium grade (when I had the choice) Sisalation 430 or 433. I found the lighter stuff to be a lot easier to tear and rip, so harder to get right. The thicker stuff is a lot dearer, used mostly on large sheds. The foil is fixed to timber battens etc. with foil buttons, that come in strips and are belted in by a hammer. You can get double sided tape for fixing it to steel purlins, but I have never used it. A thing I have used quite a bit recently is a combination of insulation blanket sandwiched between two layers of foil. It comes in different thicknesses and with different R values. It is sometimes essential to get a design to comply with be BCA's energy efficiency requirements.